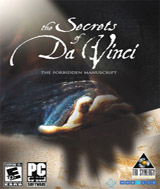 The Secrets of Da Vinci: The Forbidden Manuscript is a game created around the life and work of Leonardo Da Vinci. Players come to discover and delve inside the mysteries surrounding the hidden enigmas of the works of the great genius in a thrilling mystical quest into the heart of the Renaissance. You play as Valdo, an ambitious apprentice who has been sent to Leonardo´s French estate, the Manoir du Cloux, to uncover a hidden manuscript for a mysterious patron. To complete your mission, you must puzzle your way through Europe, seeking clues in Da Vinci´s notes, revealing hidden meanings, and unraveling the riddles that shelter the truth of Da Vinci´s secret. Each destination on your journey is a mental challenge that will bend the brain of even the best puzzlers. On the trail of the genius, Valdo is no more aware of the secrets he is about to unveil as the danger lurking in store for him.